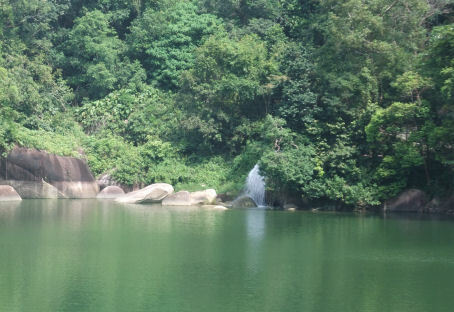 The Air Hitam Dam is an oasis of peace and nature, you can enjoy (mountain) hikes. Except on Sundays and in the early morning hours. Then the Malay come for jogging and recreation. But during the week it is an oasis of peace. The dam, which was built in 1914, is located in the town Air (H) Itam. In this town you will also find the Kek Lok Si and the train to Penang Hill. You can reach the dam by a winding road up the mountain. The road begins at the market in the town of Air Itam goes along the Kek Lok Si up. You leave the Kek Lok Si "left" behind and you drive straight up until the road ends. Note: the drive up is steep and there are a few speed bumps on this road. The dam was opened in 1962. This reservoir is a popular recreational and picnic venue. It is located on gentle hillocks, next to Penang Hill. If you are at the end of the road you can park your car in a small parking area, so you may need to park your car a little further down the road. At weekends and public holidays it can be crowded. Luckily we went on a "weekday". It's a tarred road and we noticed a lot of cyclists (who cycled all the way uphill!). You will be mesmerized by the beautiful scenery once you got up there. At the start of the dam, you encounter a guard. Do not think that you don't have access to the dam. Anyone may come here to enjoy the beautiful nature. You can just walk further. So you walk to the other side of the dam. On the left you have the reservoir and a grassy slope. Across the dam find piece of unspoiled nature. In the far distance (right) you can see Georgetown. If there is a clear sky, you can have a kook at Butterworth. The view is breathtaking. 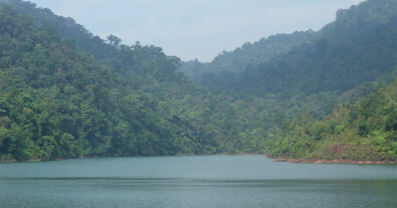 The jungle around the dam is owned by the Water Supply. During the day everyone can enter this area. At night the guards will stop you to enter this area. Only if you live in the area, you can enter it. The small reservoir that is formed by the dam, provides the city of Georgetown and other towns with water. This is called called a "water tank". This dam provides drinking water for Penangnites besides the dam in Teluk Bahang and Mengkuang Bukit Mertajam. In the rainy season the reservoir filled to the edge with water and then flows into the huge catchment structure. In the dry season, this is obviously less. Nature will take its course. Here you can make a beautiful walk in the fresh mountain air. Unusually, there are no shops or vendors, so if you want anything to eat or drink you would need to bring it. 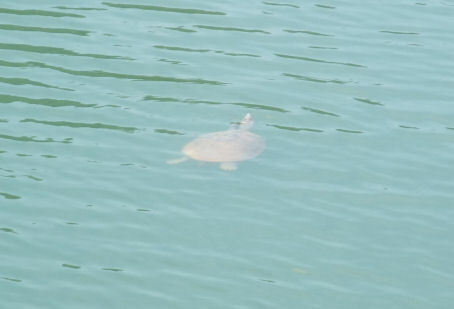 You can enjoy the beautiful scenery, colourful flowers and chirping birds.If you look around you, you will see several "wild" animals in and around the water. You can spot large iguanas on the shores and among the rocks. Who looks in the water will see large turtles, fish and maybe an otter. We also spotted an iguana. One of the Waterfalls A little further you will discover a small waterfall (photo left), that flows from the mountains in the lake. The rainwater, that falls in the mountains, is led with tubes to this waterfall. The path you walk on is tarred, because the cars and mopeds of the staff of the water supply can drive easily. They need to do their work and to walk to their work would take too much time. You will be passed by a friendly man on a motorbike. The dam is ideal for joggers and cyclers. 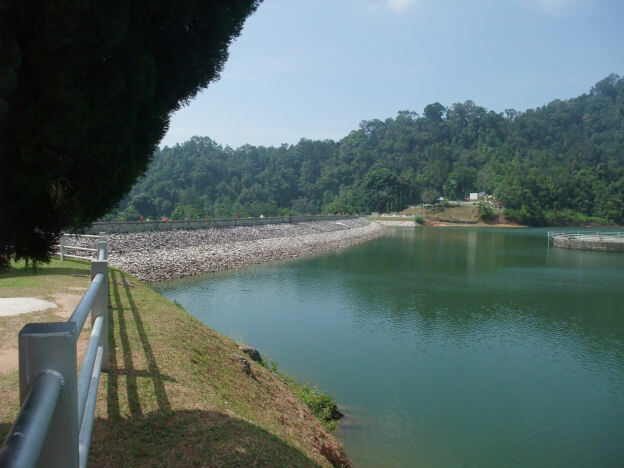 This reservoir is the starting point to other hills in the area, such as Tiger Hill, Strawberry Hill and Penang Hill. Those who do so, will find an uneven path that leads through the woods and plantations. It is a fairly easy trail and you will soon reach cultivated land where vegetables, rubber trees, durian and other fruit trees are grown. You'll pass farmer houses. The cooler temperature makes jogging, cycling or brisk-walking a refreshing experience. You will also discover many "pitcher plants". You will see many monkeys along the way too. As a real jogger, you start in the town of Air Itam to the top, the last piece will be a tarred road that leads to "water tank". The more popular trails include the Moongate Trail, trail from Air Itam Dam to Tiger Hill, trail from Hye Keat Estate and trail from the Municipal Park (formerly Youth Park). Some of the trails are used by farmers to transport produces to the markets of Balik Pulau and Air Itam. Some of the more famous pit stops at the hill are 52 and 84. At these pit stops, the view of island is visible to hikers who are able to get some water and tea prepared by locals stationed on the hill.